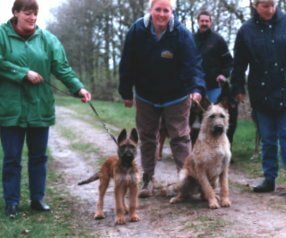 The Laekenois breedinggroup in the Netherlands ! Petra Colijn & Ton v.d.Walle, Beerta. All situated in the North of the Netherlands. There even is a chance that there is fourth breeder who also is interested. 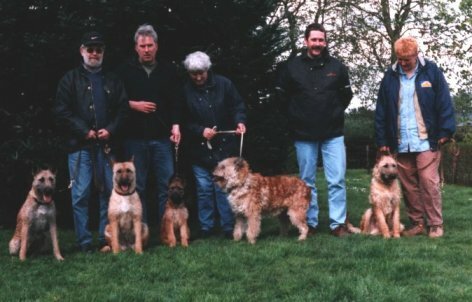 is almost bigger then the total of Laekenois breeders in the Netherlands. You can say that this initiative is the result of alarming news about the situation of the Laekenois population in the Netherlands. We hope that we can give a new inpuls to the population of this very nice variety of the Belgium Shepherd. We are open for suggestions and if there are people, that think they can help us, they are very welcome. of the Laekenois. Now it is almost the oposit. fond of the Laekenois and who want to change this situation. and that it will ad an extra dimension to their hobby. Our first meeting was at Donkerbroek at 18/4/1999. Laekenois for a long time. A unique combination those two. are less experienced but they compensated that with enthusiasme. impulses for the Laekenois in Holland.